I am not the target audience for the strip, which is fine. But creator Bil Keane’s work is impressive by sheer force of longevity. First publised in 1960, The Family Circus enters its sixth decade as the most widely syndicated comic strip in the world. A conservative estimate tallies over 15,000 cute things that kids have said. Hit the jump for a bit more info on the comic, plus a few choice selections from the funny pages. 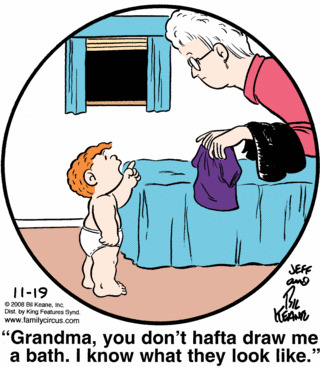 The Family Circus (originally The Family Circle) is a syndicated comic strip created and written by cartoonist Bil Keane and inked/colored by his son, Jeff Keane. 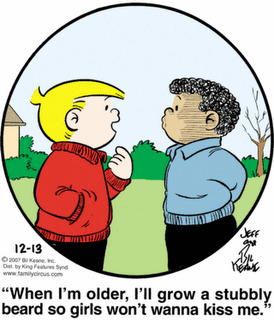 The strip generally uses a single captioned panel with a round border, hence the original name of the series, which was changed following objections from Family Circle, the magazine of the same name. 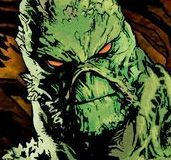 The series debuted on February 29 – Leap Year Day – in 1960, and has been in continuous production ever since. According to publisher King Features Syndicate, it is the most widely syndicated cartoon panel in the world, appearing in 1,500 newspapers. 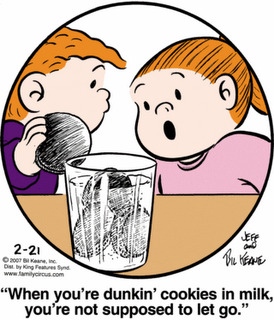 Compilations of Family Circus comic strips have sold over thirteen million copies worldwide. The central characters of the Family Circus are a family whose surname is rarely mentioned. The parents, Bil and Thelma (Thel), are modeled after the author and his wife, Thelma Carne Keane. Their four children, Billy, Dolly, Jeffy, and P.J., are fictionalized composites of the Keanes’ five children. With the exception of P.J., the characters have not aged appreciably during the run of the strip. Now if you’ll excuse me, I’m gonna go get a vasectomy.